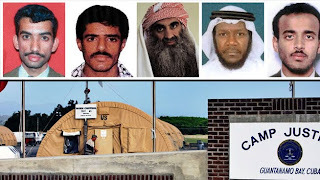 The Department of Defense has reinstated the military commission charges against Khalid Sheikh Mohammed (KSM) and his alleged 9/11 co-conspirators (above, photo credit). The five defendants were first charged in 2008. The original charge sheet is available here. These charges were dismissed without prejudice in January 2010 when the decision was made to prosecute them in federal court. That option unraveled following fierce opposition from Mayor Bloomberg and others—a profound disappointment for Attorney General Eric Holder. With these and other reforms [such as banning the use of statements taken as a result of mistreatment], military commissions, along with prosecutions of suspected terrorists in civilian courts, are an available and important tool in combating international terrorists that fall within their jurisdiction while upholding the rule of law. The interagency January 2010 Guantánamo Review Task Force Report, generated in connection with Executive Order No. 13,492 to consider the factual and legal bases for the continued detention of all individuals held at Guantánamo, indicates that another 44 detainees have been slated for prosecution, either before military commissions or Article III courts. All crimes are alleged to have been committed “while in the context of and associated with hostilities”—the nexus to armed conflict necessary to bring these charges into the law of war. As we've discussed more fully here in our critique of the Military Commission Act of 2009, military commissions may only assert jurisdiction over violations of the law of war. Many of the charged crimes (such as conspiracy and hijacking) are not standard war crimes. While other detainees have been charged with conspiracy, so far there has been no full or direct challenge to the propriety of these potential charges in the 2009 Military Commission Act. The KSM case may provide just such a challenge. During the prior proceedings, however, most of the defendants "fired" their representatives, which may prevent a full adversarial attack on the legal sufficiency of the charge sheet. See our prior coverage of these issues here, here, & here. The accused will be arraigned within 30 days. Stay tuned!